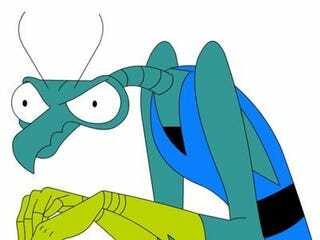 What if a praying mantis decides to be an atheist? No, really, think about it? What would you call it? A Prayer-Mocking Mantis? A Communist Mantis? A Mantheist? A bug? I suppose it really doesn't matter what we call it as long as we respect it's rights to believe or disbelieve whatever it wants. This probably only makes sense to me, but bugs don't bother me, unless they're bothering me. What I mean is, bugs, unless they are actively in my face, or buzzing me, or crawling on me, don't bug me. And by bugs, I mean insects, and insects only. Arachnids are a whole different story. I'm not entirely sure what it is about insects vs arachnids that bothers me. I mean, arachnids have two body segments, insects have three. Arachnids have eight legs, insects six. So is it those two extra legs? I don't know. But Insects don;t bother me at all. Spiders and scorpions? Kill them all with fire. Then kill their ashes with poison. Then kill the poisoned ashes with more fire. The only thing I hate more than ketchup are arachnids. (yes, spiders and scorpions are both arachnids). Even the dead ones give me the willies. But, instead of continuing this subject and giving myself the heebie-jeebies, let's move along to the fact that it's Tuesday. Tell The Truth Tuesday, to be exact. wasn't. It is true. Russia planned on delaying the Germans as much as they could with inexperienced women flying slow, out matched bi-planes. And, as fate would have it, they were exactly what the Russians needed to stop them. The inexperienced women were reenforced with experienced men, and together, they extracted a heavy toll from the Germans. They also gave the Russians enough time to set up defensive lines and restart factory production to begin the process of churning out the needed materiel needed to push the Germans out of Russia. So how do you think I'm going to top yesterdays story? That was a pretty impressive oddity. I'm not sure how I'll top it. So, I'm not even going to try. It's true. I'm going to be lazy and just toss out an oddity. I could spend a month trying to top yesterdays post. So, Here's todays oddity. Try not to fall asleep reading it. In 1918, Europe was tired. And mostly dead. After four years of bloody war, the continent was ready for peace. So Germany agreed to surrender. But the British and French decided that peace wasn't enough. They wanted retribution. They made outrageous demands of the Germans, and then kept shoving them down the Germans throats until they signed. After the Treaty of Versailles was signed on June 28 1919, Frances top general, Ferdinand Foch said "This is not peace, this is an armistice of 20 years!". And he was right. 20 years and three months later, Germany invaded Poland, sparking World War Two. Although, a valid argument could be made that World War Two was actually a continuation of the first, since the driving force that led to the rise of Hitler and the Nazis was the way the Allies treated a defeated Germany back in 1919. See....I told you todays oddity wasn't as good as yesterdays.